Well, it's happened again. The world's come to an end. Damnit, Carl! I told you to stop burning those tires and just spraying aerosols all over everywhere! Now the temperatures have risen enough that much of the American South and West have been abandoned. Also, you allowed all those corporations to gain all that money and power. Now the government's pretty much worthless and the various privately-owned armies just work to make the rich even richer. 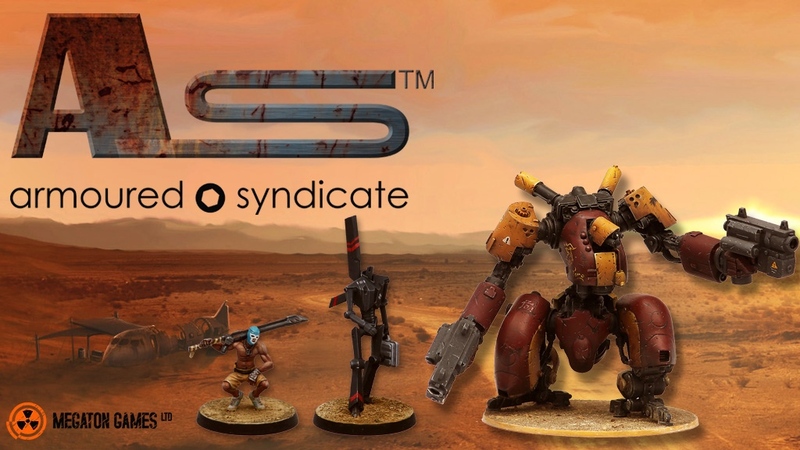 That's also the story behind Megaton Games' new sci-fi miniatures game, Armoured Syndicate. They're up on Kickstarter now. The game is a small-scale skirmish game, with players controlling as few as 3-4 minis. It also features a unique "cash flow" system. As you battle, you can make loans for a Central Bank. You can then use that money to call in air strikes, buy new gear, or even bribe your opponents into switching side. But don't spend too much of your money, as victory is determined by the player with the highest value of banked assets at the end of the game. Why blow up your enemy's high-tech kill-o-bot, when you can instead reprogram it and take it back home with you? The campaign is already over its funding goal. So it's onward to stretch goals for the next 20 days.